Imagine gazing out from your garden to a “borrowed” view. The breathtaking vista offers you a mountain or a lake; a wooded valley or a meadow. You admire the landscape painted with nature’s organic palette. Take a breath. Take a deep breath. And watch the scene unfold. I can picture this setting in my mind’s eye because I’ve visited many glorious gardens on this continent and on others, which are designed to capture the outward perspective. There are certainly grand estate gardens sited to emphasize the “fair view.” But even humble little city lots have their own viewpoint. I’m thinking of my 70-by-100 square-foot-lot in Seattle, which was blessed with a vista that included Seward Park’s old-growth firs and cedars; Lake Washington; the Cascades and even (rarely) Mount Baker to the north. Now, when you think about the scene, vista, landscape or viewpoint in your mind’s eye . . . think also about where you are standing or seated in order to view it. If you are in Tuscany, you might be standing on a Belvedere. 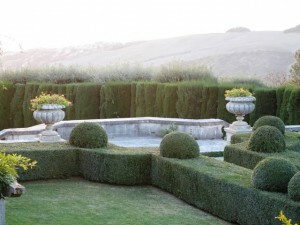 A Belvedere may be a structure in the garden, but it doesn’t necessarily have to be covered. The architectural term, occasionally spelled “Belvidere” translates as “fair view.” The Italians use this term to describe any structure placed in the garden or landscape to take advantage of a fair view (one source dates its use to the 16th century). I’m immediately reminded of the grand stone belvedere at La Foce in Tuscany. From where we stood, the views included the inner garden – a tightly-clipped parterre – and the distant views of the dreamy, rolling Tuscan hills. Little did I know at the time that I stood on a Belvedere.